As part of the publicity drive for the Mk3 Polo, Volkswagen organised a one make race series in the UK based on the G40. This was called the Volkswagen Polo G40 Cup. It involved cars of essentially identical specification so that the main factor was the skill of the driver. The cars were based closely on the road going version and used sealed engines to ensure fair competition. Most of the modifications were intended to make the car safe for racing rather than to increase performance. 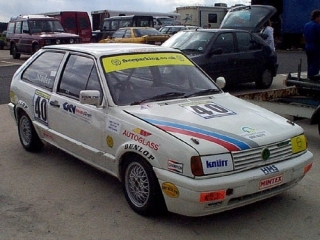 The G40 Cup had its last season in 1994 after which it was superceeded by the Volkswagen sponsored Vento VR6 Challenge. This was not the end for G40 racing however; since the demise of the G40 Cup series the cars have been amalgamated into the Super Coupe Cup. This is a competition for several different models of car that originally ran in manufacturer sponsored one make racing series. The supercharged G40 shares the track with the turbocharged Renault 5 GT Turbo, and the normally aspirated Rover 216GTi, Renault Clio 16V, and Honda CRX. The competition runs over about 15 rounds each year with individual class championships for each model. The Super Coupe Cup is a popular and active series with over 50 registered entries in the 1999 season, of which 13 were G40 Polos. Despite having the smallest engine capacity the G40 is very competitive; the 1998 G40 class winner, Peter Studer, finished second overall in the championship.